Can you call yourself an otaku without missing Magical Shopping Arcade Abenobashi, a new GAINAX series built with the otaku in mind? Welcome to the greatest video game parody anime series ever made! Or, is Magical Shopping Arcade Abenobashi the greatest sci-fi parody ever? Well, maybe it's the best action movie parody I've seen. At the very least, it's a tender, touching, coming of age tale of two Osakan kids dealing with the changing times of today. I really can't adequately describe this show as a whole, to be honest. That's why it's so brilliant. Thus, allow me to give you a few snapshots that might help you understand the big picture. If you can peg every reference, inside joke, and the meaning of life, then I'll be impressed! The tale begins innocently enough, like so many Gainax productions. Arumi Asahina and Sasshi Imamiya are wandering about town as their last vacation from school together is about to end. The Abenobashi Shopping Arcade is not the bustling hub of activity it used to be, and each new day brings news of the closing of an old business. Families are moving on to more viable areas of Japan, and while Sasshi was away at camp, Arumi's family decided to shut down their French restaurant and move up North to Hokkaido. Times are rough indeed for the denizens of Abenobashi. The only item of interest for the two kids has been their recent investigation into the relationship Sasshi's grandmother possibly had with Arumi's grandfather. Sasshi's grandfather doesn't like to talk about it, and his grandmother has passed away, so they decide to approach Arumi's elder, but they can't get any information out of him regarding his potentially shady past. What they do find out, however, is that a bit of mysticism went into the creation of the Abenobashi Shopping Arcade. Just as in Fushigi Yugi, Abenobashi is protected according to the layout of an ancient Chinese legend on the four cardinal directions by a bird, a dragon, a turtle, and a tiger. However, as businesses have failed, so too have three of the four lynchpins of Abenobashi. The only one remaining is the bird on top of the Asahina family restaurant, but an unexpected incident between a cat and Arumi's grandfather sends the guardian statue crashing to the ground below. With a smash, the last symbol of the hope of Abenobashi is ruined. However, neither Arumi nor Sasshi could have had any idea how significant the destruction of that bird would be. The next morning, things change. Drastically. Senior citizens exercising on the nearby temple grounds turn into giant bouncing mushrooms. The entire town is replaced by a giant castle, apparently French, according to Arumi. Thus begins the show. Arumi and Sasshi are the only unchanging elements of this wild ride. 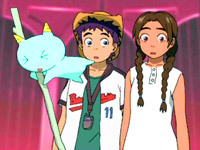 As the primary protagonists of the show, they are transported from their hometown to a series of strange alternate realities. Every new world is a heavily altered version of their home, populated with context-appropriate alternate inhabitants. For example, in a sci-fi variant of Abenobashi, the street vendors are replaced by robotic replicas of the actual people. Suddenly, I'm reminded that these are the people that made FLCL. How could I have forgotten? Rather than the excellent sustained frenzied madness that Fooly Cooly threw at us, this series establishes the rules for each world and then makes sure that the events of every episode makes sense, at least in the context of the current setting. Starting with the first world, a fantasy realm that borrows elements from a number of classic role-playing games, we discover that each new location hides a demon that must be defeated before the kids can move on to the next place. Arumi and Sasshi keep hoping that one of the conniving little creatures will finally send them home, but as each one messes up the transportation incantation, the shifts in reality become easier to adjust to. Madhouse was in charge of the animation for this series, and I doubt it was because the veteran studio had such a fitting name for this crazy show. Expect the visuals to be at least on par with the other projects they've worked on over the years, from Vampire Hunter D to Chobits. This is a very new show, so smooth animation and bright colors should accompany this bizarre adventure. As Gainax once again proves that they every bit the Otaku their biggest fans may be, the show might reference things you've never heard of. However, it's hard to misunderstand the joke when Sasshi bulks up to look like Ken from Fist of the North Star, or when he attacks Arumi's dad (who looked, at the time, conspicuously like Lao from Virtua Fighter) with a kamehameha blast in a martial arts showdown. You'll see the black obelisk from 2001: A Space Odyssey, a reference to every giant robot anime ever made with Eva music in the background), and even a nod to Ranma. This show is one that will be most appreciated by anime fans, so it's easy to recommend when you're writing for an anime website. Before the old folks in your town turn into giant mushrooms, go out and get into this lovely, mad, endearingly perverted work of art. Oh, and check your sanity at the door. Where this show will take you, such a luxury will only get in the way.